I’ve eaten and baked many a shortbread cookie, but had never heard of Hungarian Shortbread before reading the recipe for this week’s Tuesdays with Dorie recipe. The recipe is from Gale Gand. Do you remember her show, Sweet Dreams? 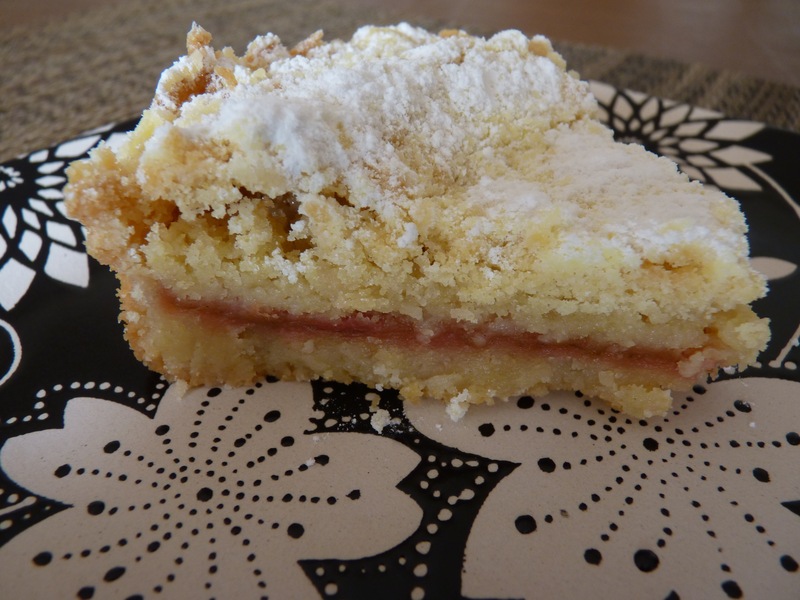 I don’t know what makes this Hungarian, but it is different than other shortbread recipes I’ve seen. The dough (flour, baking powder, salt, butter, egg yolks, and sugar) is mixed and then frozen. After a stint in the freezer, the dough is grated into the pan – this worked great! The dough was so sticky after mixing, but very easy to handle and grate after a little time in the freezer. Half the dough goes into the pan, then a layer of rhubarb jam, then the rest of the dough is grated on top. The whole thing is baked and then topped with a “generous amount” of powdered sugar. I went the extra mile and made the rhubarb jam. OK, it was only an extra quarter-mile or so, because the jam was so easy to make. Cut up the rhubarb, put it in a pan with water, sugar, and vanilla, and cook it for about 10 minutes. Fresh rhubarb was easy to find at my grocery store, so it was worth it to make this tasty jam. I strayed from the recipe and baked the bottom layer of dough for 15 minutes before adding the jam and the top layer. Other cookie bar-type recipes I’ve made call for baking the bottom a little bit first, and some of the other bakers commented that the bottom layer didn’t seem baked through, so I decided to pre-bake. It worked well – the crust was baked through and not over-browned. This was quick and easy to make, even with the extra step of making the jam. I made 1/4 of the recipe in a 6″ pan (and 1/4 of the recipe still used 1 stick of butter – yikes!). As much as I love shortbread, this didn’t quite do it for me. I liked the crumbly texture and the layer of jam, but I felt like it was missing something. My husband wasn’t a fan and thought it needed whipped cream on top. There was nothing bad about it; it just wasn’t quite as good as we’d hoped. 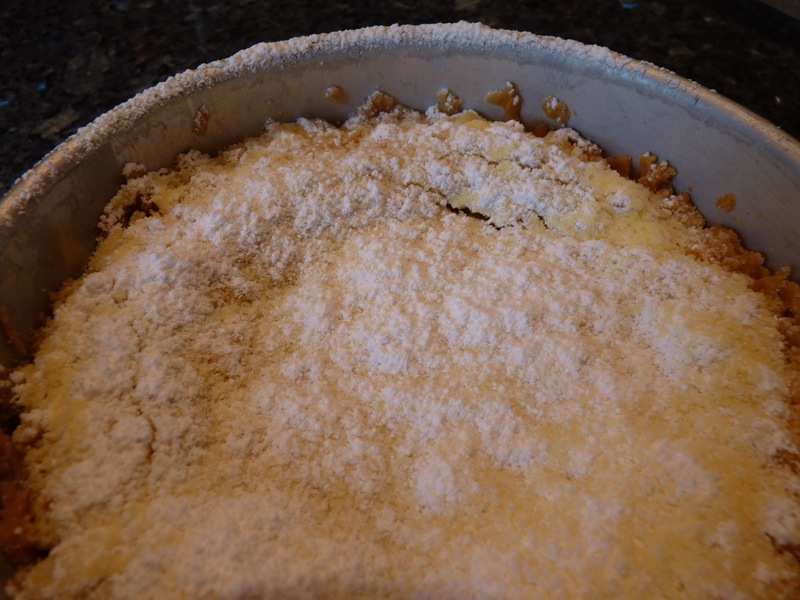 Oh well, it was still fun to try the technique of grating the dough, and the leftover rhubarb jam will be stirred into yogurt – yum! If you want to take a look at the recipe, look on page 327 of Baking with Julia. Thank you to this week’s hosts: Cher and Lynette. They will have the recipe posted on their blogs today. Your shortbread looks great Jill, even if it didn’t make bells ring for you. I liked this way too much for something so naughty, but limited myself to two pieces. This was a very sweet dessert. Yours looks light and crumbly! The photos looked so delicious, that I was disappointed to read that it wasn’t quite what you were looking for. I’ve had good success with some of Gale Gand’s recipes. Your shortbread looks great! I didn’t make the jam because I thought it would be too hard for Paul to find at the store (and I’m still house bound). I can’t wait until rhubarb is readily available here, I have so many recipes I want to try. This jam sounds fantastic, and I’m so intrigued by the grating method for the shortbread. I’ve never heard of anything like it! Wow, that looks so good…please send any underappreciated Hungarian Shortbread our way…we will be happy to swoon and make it feel welcome. I wanted to make the rhubarb jam in the worst way but I was trying to be good as I know I would have eaten it all, with or without the shortbread. That would not be a good thing. Okay, that would be a delicious thing, but not a good thing…you understand, right? Your bars look awesome to me. Your shortbread turned out perfectly! (Mine was a big mess.) I think it’s so neat that you went to the trouble to make the jam. This looks fantastic! I’m sorry it didn’t quite do it for you but it sounds like it was fun to make!